My rose of sharon has a chunk bitten out of her. It looks like maybe a deer tried to take a bite out of it doing the winter. The bite is under the main branches. Thanks. As long as the bark is not girdled (removed all the way around the trunk), the best thing you can do is clean the wound out with water and then wrap the area loosely with tree paper for the winter. Do not paint the wound or fill it in as this can trap disease against the open wound and cause serious damage. It was likely deer that did this, so I would also recommend that you take some action to protect this plant and surrounding plants. 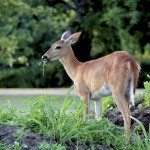 Deer tend to feed on a path, so will often return to areas they had fed before. This time of year (due to over population) they are starving and will eat ANYTHING (bark, branches, anything that is plant and can be chewed). Wrap the trunk in chicken wire to prevent further damage and take similar steps with surrounding plants.